Italy’s 5-Star says Paris is fuelling unemployment and migration by backing the region’s single currency. It’s true the 74-year-old franc keeps the zone’s 150 mln people oddly close to their old master. But its longevity proves the merits of stable prices over cheaper exports. 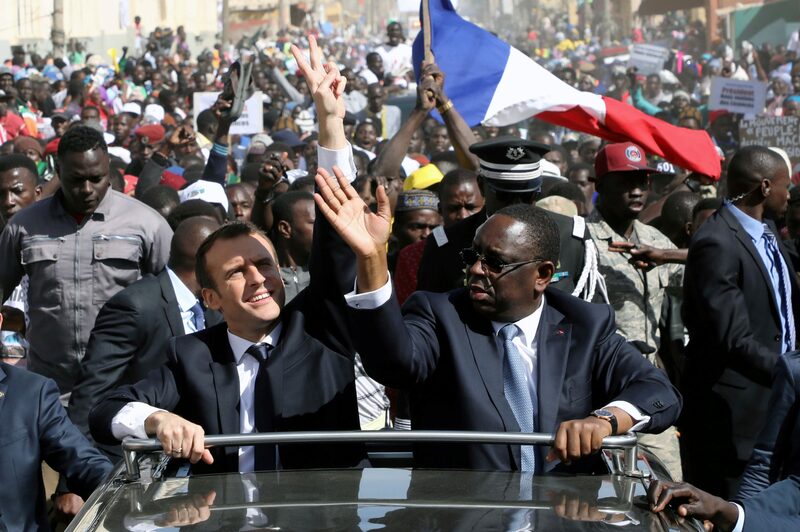 French President Emmanuel Macron and Senegalese President Macky Sall wave to the crowd from a car in Saint-Louis, Senegal, February 3, 2018. Italian Deputy Prime Minister Luigi Di Maio accused France on Jan. 21 of creating poverty in Africa and fuelling mass migration, drawing a diplomatic rebuke from Paris. Di Maio focused his criticism on France’s underpinning of the CFA, a colonial-era currency use by 14 West African countries. The CFA is pegged to the euro.